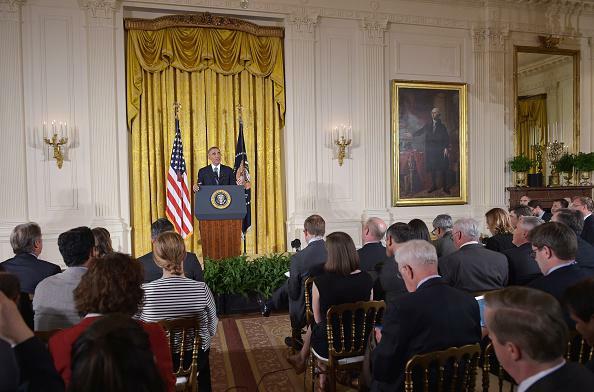 Obama, immigration executive action: President says he'll follow through. Obama in the East Room on Wednesday. For some time, the Obama adminstration has said the president would take unilateral executive action to reform the United States immigration system—a Congressional bill addressing the issue having died last year due to Republican opposition in the House—after Election Day. On Election Day, many many many Republicans won office, few of whom are noted progressives on immigration, and many of whom have complained about how often the president implements policies via executive action. Today, presumed Senate majority leader Mitch McConnell said that taking such action on immigration before a new Congress is sworn in would be a “mistake” like “waving a red flag in front of a bull,” the bull being his Republican caucus. (Doesn’t that usually end badly for the bull, though?) Would a chastened Obama, at today’s press conference, change course to acknowledge yesterday’s wave of Republican victories, perhaps dialing back his immigration ambitions? Before the end of the year, we’re going to take whatever lawful actions that I can take, that I believe will improve the functioning of our immigration system. We all agree on the need to create more jobs that pay well. Traditionally, both parties have been for creating jobs rebuilding our infrastructure—our roads, bridges, ports, waterways. In the five states where a minimum wage increase was on the ballot last night, voters went five for five to increase it. That will give about 325,000 Americans a raise in states where Republican candidates prevailed. So that should give us new reason to get it done for everybody with a national increase in the minimum wage. Immigration reform, a minimum-wage hike, and a corporate-tax-reform-and-infrastructure jobs bill: That, at least for now, is your Barack Obamagenda.